Welcome to OARS’ ten day Intensive California Guide School with Swiftwater Rescue Certification. We aim to teach you everything you need to know about river guiding; prior experience is not a prerequisite. If you are in good shape, have a positive attitude and want to learn wilderness skills in an outdoor setting, you will have a memorable experience and gain new skills that will last a lifetime. This course is designed for those hoping to become professional river guides, as well as those wanting to safely guide their own private river trips. This course is taught by our river managers and professional guides—each passionate about whitewater rafting, river safety and sharing their knowledge. Learn to competently maneuver rafts in intermediate Class III-IV whitewater. This course includes Swiftwater Rescue training, which covers techniques for safe river crossings, swimmer rescue, wilderness evacuation and emergency medical approaches. Morning is spent reviewing the equipment to make sure it’s river ready. We set off down the river after lunch, utilizing the knowledge gained during the first 3 ½ days of guide school. We take turns as paddlers and paddle captains while we navigate the South Fork’s Class III whitewater. We gain experience in understanding the hydraulics of the river. We learn how to use ropes and tie knots while practicing river-crossings and a variety of rescue scenarios. We continue our on-river instruction while gaining skills such as river navigation, maintaining ferry angles, eddying out and communicating by using crew commands. Expect to spend the entire day on the river, returning at night to our riverside classroom. Another highlight of the guide school is learning to prepare riverside meals, with student cook-crews taking turns to prepare breakfast, lunch and dinner. 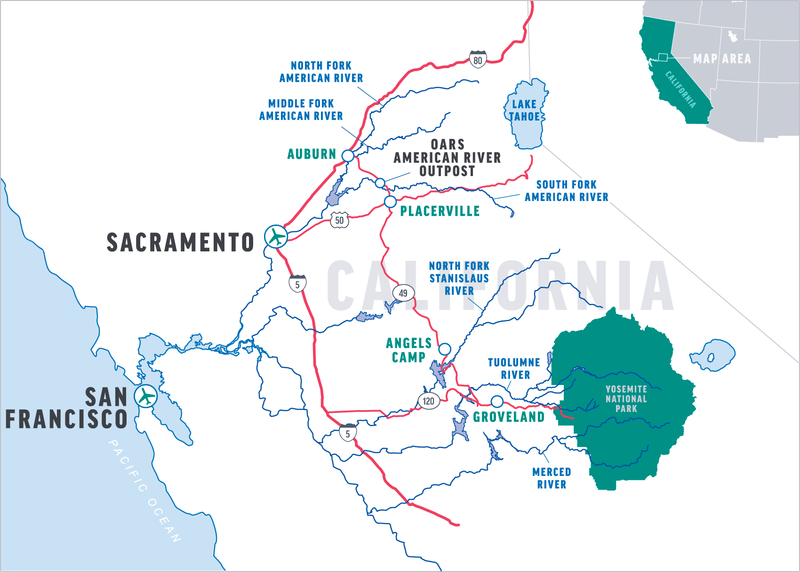 Depending on water flows and group skills, we might journey to other California rivers, such as the Middle Fork of the American and/or the Merced River. We continue to hone techniques learned throughout the previous six days. Our evenings are spent at our riverside classroom before retiring to a night under the stars. 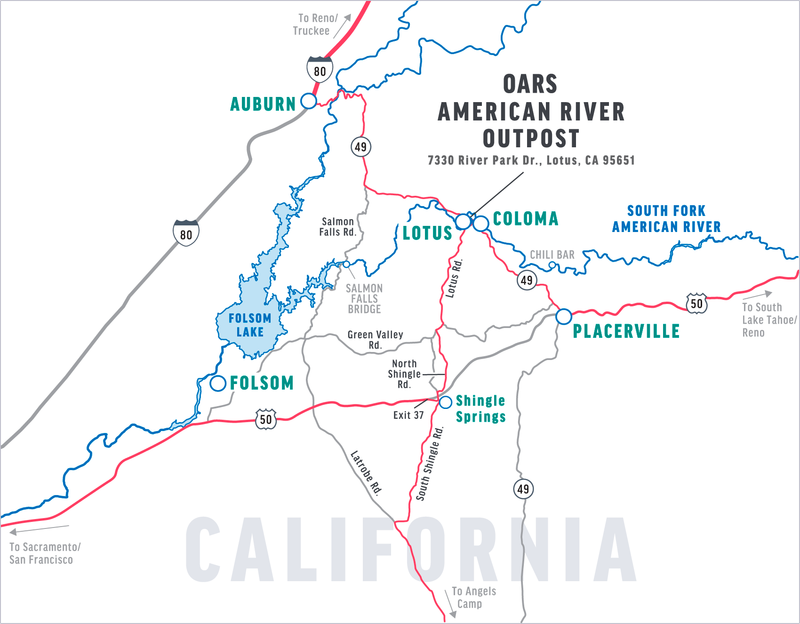 On the final day of our trip, we will return to the OARS American River Outpost at approximately 6:00 pm. From Sacramento on U.S. Hwy 50: Follow Hwy 50 east toward Placerville and South Lake Tahoe. Take the Ponderosa Road exit (Exit #37), turn left onto Ponderosa/S. Shingle Road and cross over the freeway. At the second stop light, take the right turn on N. Shingle Road toward Coloma/Lotus. After about 4.5 miles N. Shingle Road turns into Lotus Road—continue going straight for about 6 more miles. As you approach Lotus, pass through the town’s first stop sign and continue to the 3-way stop sign intersection with Hwy 49. Turn left onto Hwy 49 (north) and cross the bridge over the South Fork of the American. Right after crossing the river, you will see the “River Park” shopping center on the left, with signs for Hotshot Imaging. Please use the center’s second entrance, where a left-turn lane is provided at River Park Drive. Look to the back of the shopping center, where you will see the entrance to our American River Outpost. These are approximate mileage and driving times and do not take into account any delays. Please allow yourself extra driving time. For more detailed driving directions, we recommend you visit www.mapquest.com or www.google.com/maps. On the final day of your guide school, you will be returned via shuttle to the OARS American River Outpost. You should arrive back by approximately 6:00 PM. We provide plenty of water and lemonade and two sodas per person per day. You are welcome to bring your own favorite beverages, alcoholic (assuming you are at least 21 years of age) or non-alcoholic, in non-glass containers. For your safety and the safety of others, alcoholic beverages are limited to evening enjoyment, after class is over. During the day—Start with a swimsuit and/or swim trunks and synthetic or merino wool shirt as a base layer. Depending on the weather, temperature and how wet you’re getting in the rapids, additional layers for sun protection or insulation can be added or subtracted. O.A.R.S. West, Inc. and cooperating agencies act only in the capacity of agent for the participants in all matters relating to transportation and/or all other related travel services, and assume no responsibility however caused for injury, loss or damage to person or property in connection with any service, including but not limited to that resulting directly or indirectly from acts of God, detention, annoyance, delays and expenses arising from quarantine, strikes, theft, pilferage, force majeure, failure of any means of conveyance to arrive or depart as scheduled, civil disturbances, government restrictions or regulations, and discrepancies or change in transit over which it has no control. Reasonable changes in itinerary may be made where deemed advisable for the comfort and well-being of the participants, including cancellation due to water fluctuation, insufficient bookings (this trip requires a minimum of 6 students), and other factors. There is risk in whitewater rafting, particularly during high-water conditions. Rafts and kayaks can capsize. You could be swept overboard. Your guide will make every attempt to assist, but you must be strong and agile enough to “self-help” and “float-it-out” without further endangering yourself or others. We reserve the right not to accept passengers weighing more than 260 pounds or with a waist/chest size exceeding 56 inches. We may decide, at any time, to exclude any person or group for any reason we feel is related to the safety of our trips. We are experienced at accommodating people with various disabilities. Please give us an opportunity to make you feel welcome. We need to discuss any special requirements ahead of time. On advancement of deposit the depositor agrees to be bound by the above recited terms and conditions. Prices subject to change without notice.